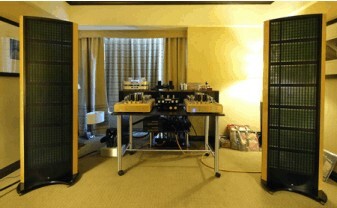 As a fan of electrostatics—I used to own KLH Nines and original Quad 57s—I was intrigued by the favorable reports of the King Sound Prince II full-range electrostatics in both the 2010 CES and the Axpona show reportss, and was pleased to find out King Sound listed on the list of exhibitors at SSI 2010. It was one of the few exhibits that I actually sought out rather than just allowing myself to find it in the course of walking the show floor. And I was most impressed. The sound—with electronics from McAlister, a company that I'll be writing about in a separate blog entry—had the clarity and lack of "speaker" coloration that reminded me of the KLH Nines and Quads, but the speaker seemed to be able to play louder than than these classic 'static designs. The retail price of $6500/pair seems very reasonable. I think I've found my next speaker to review. Or maybe the King II, which is just being introduced—but it may be too big for my room. Barrie, Ontario, about an hour's drive from Toronto, with a population of about 130, 000, is not a city that I associate with the design and manufacture of high performance audio equipment. It doesn't have even a single "real" audio store, just Best Buy, etc. But, as I found out at SSI 2010, Barrie is the home of McAlister Audio, maker of the OTL-195 monoblock amplifier and a prototype preamp. The designer is Peter McAlister, who produced his first prototype output-transformerless power amp ten years ago. The OTL-195 puts out 150W, and appears to be a very sophisticated design: fully balanced, able to drive 4 ohm loads, a circuit that tracks the signal level in the driver stage and modulates the control grids of output tubes, and various other circuit refinements. The OTL-195 is hand-built by Peter McAlister himself, and utilizes high-quality parts. The price is $8500/pair. As I mentioned in the blog posting below, the King Sound Prince IIs sounded great driven the McAlister OTL-195s. McAlister's amps are becoming a bit of a legend all over Canada and although I know of at least one local (Edmonton) owner of Peter's OTL design I'm still waiting for an invite to hear it. But from what I'm given to understand this amp is driving a pair of old Accustats - and any amp that can drive these venerable old warhorses is an amp to be taken seriously. Word through the grapevine is that the owner is extremely happy with the OTL - and he's been into high-end audio for over 40 years! The PP150S stereo power amplifier utilizes horizontal output tubes to produce 75 watts per channel. 6EM7 dual triodes are used for the input, phase slitter and driver stages and EL504 / 40KG6 horizontal tubes for the output stage. Just so you know, this piece is not on manufacturer loan. I purchased this amp from a friend after a short audition. After a call to Peter McAlister and a note to our publisher, the review was planned. The PP150 is a big amp, though the main chassis weighs only 30lbs. That’s because the power transformer, about 20 lbs by itself, is housed in a separate box. The two pieces are connected by a 6 foot umbilical cord covered in flex tubing. pentodes like EL34s, 6550s or KT88s. Coupled with the huge power supply, the McAlister provides a very powerful sounding 75 push-pull watts per channel. The amp features point to point wiring and custom output transformers hand wound by Peter McAlister himself (see sidebar). McAlister Audio exudes some of the best diy cachet that can accompany products from workshop-based companies. The casework looks handmade because it probably is. There are visible welds on top and bottom of the chassis. The casings for the transformers are made from thin steel, and I wouldn’t feel comfortable laying the amp on its side or on its top. The power transformer hums a bit, but sits in an out of the way corner where I can’t hear it. Anyway, Peter says he’s fixed the hum since my amp was built. The flex tubing on the umbilical cord doesn’t mate perfectly with the transformer case or the connectors. The black paint on the main chassis is nicely applied and good looking, but collects dust. And I don’t like the name PP150. That’s all the bad. I love the looks - it’s retro, rich looking and outrageous all at once. And it is handmade. Mostly by Peter in Ontario, Canada. Not in China. "My company philosophy is to produce high end audio products at reasonable costs with the emphasis on performance. I feel there is a huge demographic of people that would love to get into 2 channel tube audio but are intimidated by the high costs. Alot of manufactures spend their efforts on cosmetics and esoteric parts ( marketing ) and very little on design. In fact a large number of tube products actually use existing design schematics from the 50's with better power supplies and much better capacitors- the result is a better performing unit that was available in the 50's/ 60's but the bar can be raised much higher. Since my costs are nowhere near the bigger companies I do not have to sell hundreds of units just to meet my fixed budget so therefore do not have to produce product based on marketing and agreement reality. In a tube amplifier 70% of the performance is the circuit design and the single most important component is the output transformer. It’s interesting to look at the very first high fidelity amplifier design in 1947 (Williamson). This amplifier used all triodes for the input, a proper driver stage and a well designed output transformer. The power supply was anemic and the amplifier used cathode biasing which slowed the speed and produced a weak bass response but still this amplifier would hold its own against many products currently in production. Almost all vintage amplifiers and some currently manufactured tube amplifiers have pentodes in the input stage (higher gain but very noisy), no driver stage (this is all too common and severely limits the transient response) and cathode /automatic biasing - no biasing of the output tubes required (Cathode bias output stages limit the bass response and slow the amplifier speed). - All triode input and a phase slitter circuit design that does not go out of balance at high signal levels and characteristics do not change as the tubes age. - All triode driver stage that properly drives the output section. - Horizontal sweep tubes that have huge cathodes and can pass lots of current with lower overall distortion than any audio tube. "The output transformers are custom wound M6 core that have 4 primary and 3 secondary sections with each layer dipped in varnish prior to insulation. Plate voltage is delayed 30 seconds to prevent cathode stripping. This high voltage delay is accomplished with a damper diode rectifying the relay coil voltage through a controlled warm up. The separate power supply uses a massive power transformer system. High speed diodes, regulation and 2x 15,000uf of capacitance paralleled with film capacitors are used in the power supply. Electrolytic capacitors are only used in the power supply and power distribution networks. Distortion and speed are greatly improved with the addition of a drive stage between the front end 1st gain / phase splitter and output stage. The end result is an extremely stable high wattage power amplifier that has a flat frequency response; low distortion and output stage/transformer overshoot of less than 1%". Peter, why did you choose the sweep tubes for power? The only other amp I know of like this one is the EAR PL509, which has a great rep, but hardly anyone's heard it. Comments? 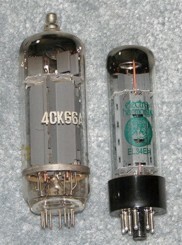 "Sweep tubes are far superior to audio tubes with lower distortion and can pass lots of current due to large cathodes. An example would be the EL34 which has the highest plate voltage rating of 800 volts- sweep tubes can handle 7,000 volt peaks. The EAR PL509 is a good amplifier that puts the signal into the screen grid with the signal grid grounded. 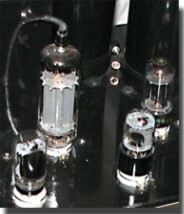 This triode connection reduces the plate impedance and can work quite well producing a much lower output. My single ended designs ( SE-32/44 ) also use this type of circuit but are driven directly from the driver stage without any coupling capacitors. The PP-150 and MB130 are connected differently; the EAR PL509 with the signal into grid #1." Are all of your tubes provided NOS? "NOS" stands for "new old stock", meaning the tubes are old, perhaps even from the 40's, that test as good, or almost as good, as new. Most tube people are certain these most often sound better (and are generally more costly) than those being made today in China or the former Soviet Bloc. No tubes are currently made in the US - publisher. "Yes - tube manufacture is not critical to performance due to the circuit design. My only comment would be that some Sylvania sweep tubes have been unstable". Startup - You told me that the big glow from the bottom of the power tubes at start up was normal. The front tubes also glow brightly then dim a bit, as the center tube (function?) gains in brightness. I'm guessing there is no soft start on this amp. "The initial brightness is the filament design - when cold, the resistance is very low so the initial current requirement causes the extra brightness. I do not use a slow filament start as I have no issues with filament life being shortened. I do use a high voltage delay as this does make a difference on tube life expectancy." Also Peter, I'd like to put the amp sideways to look at the guts, but am leery of leaning the amp on the transformer covers. Is there a safe way to look at the underside? "You would have to be very careful. I only use point to point wiring as in my view this is superior. The down side to point to point wiring especially in my designs is that you have 100's of connections and tie points so with lots of wires it can look messy. I use the shortest path on connections and do not use the underside for marketing with extra lengths of wire at right angles". I’ve heard this track done properly through MBL electronics and the big MBL 101Es. About a quarter mil all in. With the McAlister amp driving big electrostat panels in my house, I’m not there yet, but am getting satisfyingly close. I was listening to Emily Lou Harris “The Maker” from Spyboy when I started typing up my notes. Had it on medium level when the drum solo came on, then stopped writing and restarted the track at near concert volume. Holy crap. This is what drums sound like in concert. Not unamplified, but what I expect when the mics and the board are right, from the kick drum through the cymbals. To give the amp a proper workout, I disconnected my bass amp and turned off the sub, running my large (6ft tall, 12 inch woofers) Martin Logan ReQuests full range from the McAlister. Starting with Patricia Barber’s Fortnight in France the bass was well defined. At first listen, better than the bi-amp setup. Percussion details are eerily present in the room, it’s as if you can see the drums being hit. The stand up bass is, dare I say, perfect. Better in fact, than with the bass amp and sub connected, telling me that the recording (and probably the live performance) had more low bass than was needed. Anna Moffo in 1959 on RCA Living Stereo SACD produced a sound I judged better than I’d heard from the Magico Minis during a demo at the last HE show. String tone is delicious, with a strong orchestral foundation. The singing is spectacular, and the recording does it justice. Chris McBride’s Gettin to it CD is a tougher test. This is a superb big band recording, and I gave the volume control a twist to the right. The band hits hard, especially on the brass attacks in “In a Hurry.” These sounded just right to me- as an ex-trumpeter who used to sit in the middle of the band, the trumpets and trombones had the right combination of attack, brass and blatt. The sound was somewhat cleaner than the bi-amp setup, my feet were tapping and the Mcalister had not run out of steam. Waay cool. All right, the amp can do opera and a live jazz band in my largish room, tethered to 89db rated hybrid electrostats that provide a real tricky load. Can the amp reproduce a rock concert? In went Tori Amos’ “A Sorta Fairy Tale.” You might guess this is a quiet ballad, but you’d be wrong. The track carries a stomping kick drum bass combo that goes way down deep. Twisted the volume another notch to the right and let 'er rip. For the first 30 seconds or so, the McAlister gamely kept up. Fairy Tale exploded into the room. I’m thinking this is maybe the greatest amp ever. No way is this 75wpc. Then the laws of physics kicked in and sounds of distress from the right channel prompted a return to a more sane SPL. At a lower level, the bass and drums lacked ultimate slam. All right, physics rules. Lets see what happens with the Bryston and sub back in the mix. Hooked everything back up and cranked the excitement factor to 11. The only reproduced sound that has come close to this in my experience has been at shows with big, $100,000+ systems. Handling the panels only, the McAlister sails through the toughest dynamics with ease. More Tori, at slightly lower levels - “Sweet Dreams” from the Winter EP. The percussion goes far to the side of the speakers - I had not heard this before. The piano is nicely centered, and I would like to say I could identify the sound of the Bosendorfer as such, and not say, a Steinway D, but that would be cheating cause I know what’s being played. The piano is very realistic on the simply produced “Upside Down.” On the Hey Jupiter EP, the title song is glorious, with a church organ and backing vocals soaring over the melody. The live version of “Sugar” captures Tori’s mic technique- that is, the mic is at her lips or down her throat. You hear every nuance of her breathing, way too much info for non-Tori fans. Classical: Dvorak’s “New World.” Gorgeous. Space, air, detail, body all in proper proportion. From the Brandenburg Concerti, the best reproduction of violin I have ever heard, bar none. The combination of PP150 and electrostatic speakers is perfect (Peter voiced this amp with e-stat speakers, but I don’t know which ones). My amplifier has two controls on the front face that are not standard on the PP150. One is called “Focus”, which adjusts the level of local feedback (there is no global feedback) and the other is a high frequency attenuation selector with four positions. I run the amplifier with near minimum feedback and in the #2 HF position. Switching to #1 gives just a bit more highs, but is more than I find optimal. Fitting these extras to the amp is highly recommended. I believe that almost anything can be improved by fine tuning. They add $250 to the base $1,500. With my amp, there is hum emitted from the separate transformer. It is not loud enough to hear from my chair, but it could be from yours. However when I asked Peter about this, he told me that his latest models have changes that now make them "very quiet". 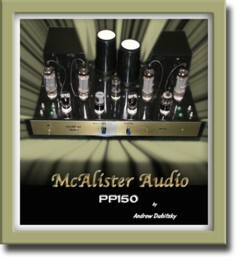 From the start, the McAlister PP150 impressed me as having the best attributes of tube amplification. It’s big, powerful and full bodied. Not tubey in the classic, Mac 240 way. You get bags of air and all the detail that’s present on your recordings. There’s fierce attack and wondrous decay. In other words, the McAlister has MOJO! The amp is near dead silent. By itself, powering full range speakers in the 88-90db sensitivity range, expect terrific but not unlimited dynamics, excellent control and slam in the bass, a delicate treble and full fleshed mids. Within its considerable limits, this amp ranks among the best, regardless of cost. The best stereo systems can make almost any recording exciting as they recreate the musical event - the notes and the emotion. There’s a magic factor that I normally associate only with tubes, and the McAlister has it in spades, with no downside. At the price Peter asks, it’s a stone bargain. Competition? The VTL ST85 puts out similar power levels, has a warmer, less detailed sound for about $2200. The new Cayin 100wpc integrated, from China, is north of 3k. So are the current versions of the Rogue M120s, amps from Cary and Manley. 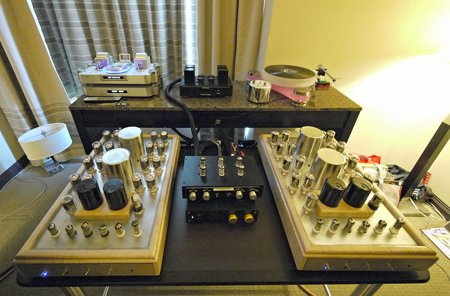 The closest amp in sound quality that I can think of is the 100wpc Kora Cosmos at $5k. There are many others, but you’re not going to get better performance unless you spend, spend and spend. 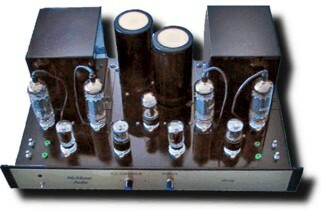 Andrew, another example is the AES Super Amp I have in for review. By comparison, it is made in the US by Cary, but the price is $1800 and it only outputs 40 watts per channel and uses new Chinese tubes - publisher. Customer options of front or rear panel input and speaker binding posts. Umbilical cord length between the power supply and amplifier to suit your needs. If you're looking for a tube power amplifier and your speakers and room are such that 75 watts per channel is sufficient, you would do well to check out this amp. This is a terrific sounding amp at a very attractive price. Okay, $1,500 for 75 wpc is more than attractive. A price that comes out of Ontario, Canada, so there's no concern about black or gray market products with shakey parts and service availability from sellers that may or may not be there tomorrow. That price includes Peter who is happy to work with you to build the amp that best fits your needs. We think it is always a value added when the designer is so accessible. Come to think of it, even if you are only "tube curious", this could be a great place to start. At the price, there is not much downside and the upside just might make you be glad you tried the tube route. Tell him Stereomojo sent you and ask Peter to add the Focus and HF controls. Fire it up when it arrives and impress your friends and s.o. Sit back and enjoy the music. Peter informs me that he now has more help with production, and that wait times for a new amp are becoming more manageable. In the past, people had to wait up to six months. In addiiton, he has contracted with a case constructor to give the amplifier better cosmetics - this will add to the price of the amp when the new cases come on line.